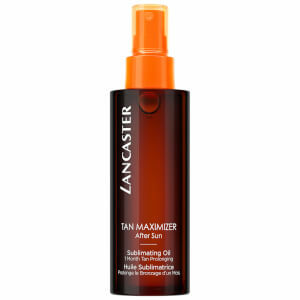 Experience the ultimate in broad spectrum sun protection with the Sun Beauty Dry Oil Fast Tan Optimiser Body SPF50 from Monaco-based brand, Lancaster. Fortified with innovative Full Light Technology, the lightweight, quick-absorbing dry oil defends against the four different types of sunlight: ageing UVA rays, burning UVB rays, visible light and infrared. The brand's breakthrough Tan Activator Complex (T.A.C.) combines Orange, Coffee and antioxidant-rich Buriti Oil to encourage a faster, deeper tan, whilst promoting firmness and elasticity. No greasy or sticky residue. Applicare generosamente su tutto il corpo prima dell'esposizione al sole. Riapplicare spesso per prolungare la protezione, soprattutto dopo il bagno, aver sudato, essersi asciugati e dopo un'esposizione prolungata al sole.